The brilliant Dr. Eureka has important experiments for you to complete! Pick a challenge card, 3 test tubes and 6 colorful balls to solve his scientific formula. Carefully move your materials from tube to tube without dropping them, and position them as illustrated on the challenge card. This brainteasing party game can be played solitary or competitively. 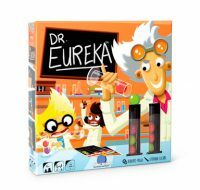 Add a Review for "Dr. Eureka"